getcalc.com's Ionic Strength Calculator is an online chemical engineering tool to measure the concentration of ionic charges in the solution, in both US customary & metric (SI) units. 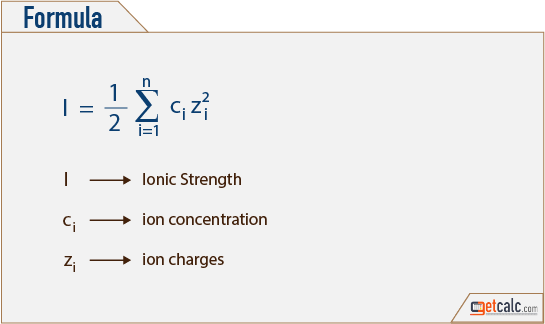 Ionic Strength, often denoted by an alphabet I, is the measure of ionic concentration in the solution, which is a quantity shows the interactions of ions with water molecules and other ions in a solution. It's a generally a function of all ions and valence bonds.